Is the Greek crisis an isolated case or the first of a series of future failing developed states? The Greek financial crisis is not on the front page of the Financial Times anymore, but it is far from over. The financial crisis did not manifest itself in Greece alone. Ireland has also sought an equally large EU-IMF rescue plan. Portugal and Spain have been under the microscope of the media and credit rating institutions. Such other instances in the Eurozone’s periphery have repercussions for the currency as a whole as well as for the EU (Straubhaar, 2010). Greece, Ireland, Portugal and Spain are members of the Eurozone area, which means that they share the same currency with economic giants such as Germany and France. I would like to thank Andreas Akaras, Elias Carayannis, Dimitrios Lagias, Manolis Galenianos, Nick Karambelas, Dimitrios Mantoulidis, Angelos Pangratis, Georgios Skoulakis and Marilena Zackheos for their helpful comments. This paper is based on a talk I gave at the Center for European Studies– European Union Center, at the University of Michigan, Ann Arbor, MI, on 16 September 2010. Azariadis, C., Ioannides, Y. M., and Pissarides, C. A. (2010). Development is theonly solution: Seventeen proposals for a new development strategy. 6 October.Available at http://greekeconomistsforreform.com/wp-content/uploads/A-I-P-DEVELOPMENTw.-abs-10-06-10.pdf, accessed 24 November 2010. BBC. (2004). Greek debt spirals after Olympics. 12 September. Available athttp://news.bbc.co.uk/2/hi/business/3649268.stm, accessed 24 November 2010. Eurostat. (2004). Report by Eurostat on the revision of the Greek government deficitand debt figures. 22 November. Available at http://epp.eurostat.ec.europa.eu/cache/ITY_PUBLIC/GREECE/EN/GREECE-EN.PDF, accessed 24 November2010. Hiotis, V. (2010a). Crash for the parties (in Greek). To Vima, 4 July. Availableat http://www.tovima.gr/default.asp?pid=2&ct=32&artid=341308&dt=04/07/2010, accessed 24 November 2010. Hiotis, V. (2010b). I want to leave Greece (in Greek). To Vima, 29 August. Availableat http://www.tovima.gr/default.asp?pid=2&ct=1&artid=351032&dt=29/08/2010, accessed 24 November 2010. Hürriyet Daily News (2010). Book claims Greek crisis stems from Ottomanrule. 4 October. Available at http://www.hurriyetdailynews.com/n.php?n=book-claims-greek-crisis-stems-from-ottoman-rule-2010-10-04, accessed 24November 2010. Kaplan, R. D. (2010). For Greece’s economy, geography was destiny. New YorkTimes, 24 April. Available at http://www.nytimes.com/2010/04/25/opinion/25kaplan.html, accessed 24 November 2010. Kathimerini. (2010a). Disappointment of voters towards the political systemgrows (in Greek). 10 October. Available at http://news.kathimerini.gr/4dcgi/_w_articles_politics_2_10/10/2010_418257, accessed 24 November 2010. Kathimerini. (2010b). Suicides have doubled (in Greek). 4 August. Available athttp://news.kathimerini.gr/4dcgi/_w_articles_ell_2_04/08/2010_410313, accessed24 November 2010. Kitsantonis, N. (2010). Young Greeks seek options elsewhere. New York Times,14 September. Available at http://www.nytimes.com/2010/09/15/business/global/15drachma.html, accessed 24 November 2010. Koleka, B. (2010). Hard times in Greece prompt Albanians to return home. Reuters,1 June. Available at http://www.reuters.com/article/idUSTRE6503WB20100601, accessed 24 November 2010. Kyriakidou, D. (2009). Greek PM calls snap election, blames economic crisis.Reuters, 2 September. Available at http://www.reuters.com/article/idUSTRE5815ZZ20090902, accessed 24 November 2010. Legge, T. (2010). Bailouts in Europe: A punitive Versailles or a benevolentMarshall Plan? The German Marshall Fund of the United States. 2 December.Available at http://blog.gmfus.org/2010/12/02/bailouts-in-europe-a-punitive-versailles-or-a-benevolent-marshall-plan/, accessed 6 December2010. Meghir, C., Vayanos, D., and Vettas, N. (2010). The economic crisis inGreece: A time of reform and opportunity. 5 August. 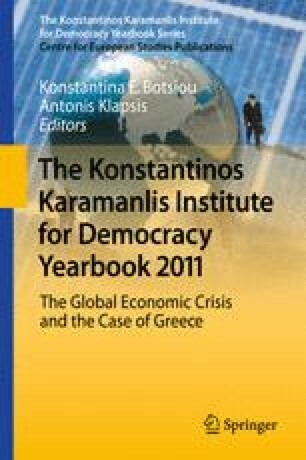 Available athttp://greekeconomistsforreform.com/wp-content/uploads/Reform.pdf, accessed24 November 2010. Pagoulatos, G. (2010). The Greek economic crisis: What it means for Greece andfor Europe. 24 March. Available at http://www.youtube.com/watch?v=NSyR8T7zSEw, accessed 24 November 2010. Straubhaar, T. (2010). Europe’s fate is staked to the euro. The German MarshallFund of the United States. 2 December. Available at http://blog.gmfus.org/2010/12/02/europes-fate-is-staked-to-the-euro/, accessed 6 December 2010. Tsakyrakis, S. (2010). Memorandum about justice (in Greek). To Vima, 8 August.Available at http://www.tovima.gr/default.asp?pid=2&ct=122&artId=347660&dt=08/08/2010, accessed 6 December 2010.